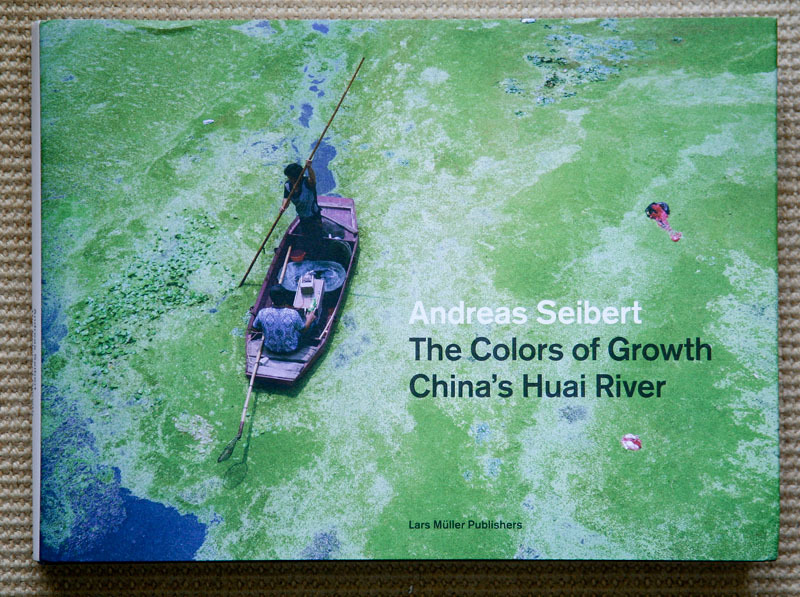 The opening color photographs of Andreas Seibert’s The Colors of Growth, China’s Huai River appear lyrical, what may seem a documentary of a beautiful place for peaceful contemplation. Then the landscape, portraits and captions rapidly transforms into a haunting narrative of a huge ecological disaster that ebbs and crawls through the bowls of China. This book is about globalization as much as it is an ecological call to action. The photographs record the dire consequences of unchecked progress of yet another developing county in the midst of rapidly transforming itself from a farming economy into an industry economy. Regretfully, these developmental disasters keep repeating themselves, but now at a vast quicker pace. Europe went through these times that spanned many hundreds of years, while the United States condensed this time into less than a hundred years. The notorious Cuyahoga River in Ohio caught fire thirteen times before the U.S. finally engaged the Clean Water Act in the late 1960’s. Seibert records the economics of a down-river business mentality, as long as the business folks live up-river of the waste-pipe of pollution, it’s not a problem. That is until the entire river essentially becomes a continuous waste-pipe of pollution, which is Seibert’s subject, a documentation of the conditions of the Huai River. Intertwined amongst the narrative of the personal impact of this polluted river are photographs of the polluted water, which are abstract and hauntingly beautiful. These photographs would be easier to contemplate if they did not represent the amount of chemical s and human waste present in the water. Fortunately, the book is visual and does not provide the foul and terrible odors present at these locations, for that we have representative documentation, both visual and his subject’s quotes, provide by Seibert. Even so, these conditions are hard to fathom. Likewise it is very unfortunate how people can become trapped in these miserable conditions, perhaps a home to generations that within in a short duration has become intolerable. The hardcover book has a dust cover and a horizontal format that is ideally suited to maximize a 35mm horizontal format image. The photographs are framed with a traditional white margin and the binding allows the book to fully open and be enjoyed. The book’s text and captions are provided by Seibert. Note: From my six weeks in China, one of which was in the port city of LianYungGang where the Huai, after meeting the Yangtze River, empties in the Yellow Sea, I can attest to some of these dismal ecological conditions in China. La edición de este libro nos puede servir para ejemplificar algunas de las cuestiones formales que vimos ayer en clase, por ejemplo como equilibrar fotografías de tamaños diferentes o cómo manejar texto e imagen.